"FAKE - F# Make" is completely written in F# and all build scripts will also be written in F#, but this doesn't imply that you have to learn programming in F#. In fact the "FAKE - F# Make" syntax is hopefully very easy to learn. trace "Hello World from FAKE"
As you can see the code is really simple. The first line includes the FAKE library and is vital for all FAKE build scripts. After this header the Default target is defined. A target definition contains two important parts. The first is the name of the target (here "Default") and the second is an action (here a simple trace of "Hello world"). 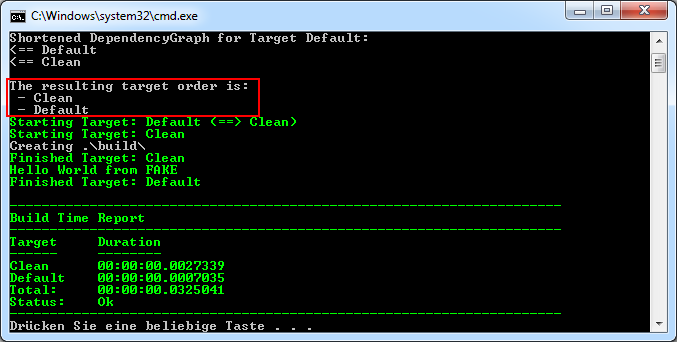 The last line runs the "Default" target - which means it executes the defined action of the target. We introduced some new concepts in this snippet. At first we defined a global property called "buildDir" with the relative path of a temporary build folder. In the Clean target we use the CleanDir task to clean up this build directory. This simply deletes all files in the folder or creates the directory if necessary. We defined a new build target named "BuildApp" which compiles all csproj-files with the MSBuild task and the build output will be copied to buildDir. In order to find the right project files FAKE scans the folder src/app/ and all subfolders with the given pattern. Therefore a similar FileSet definition like in NAnt or MSBuild (see project page for details) is used. In addition the target dependencies are extended again. Now Default is dependent on BuildApp and BuildApp needs Clean as a prerequisite. This means the execution order is: Clean ==> BuildApp ==> Default. This time we defined a new target "BuildTest" which compiles all C# projects below src/test/ in Debug mode and we put the target into our build order. 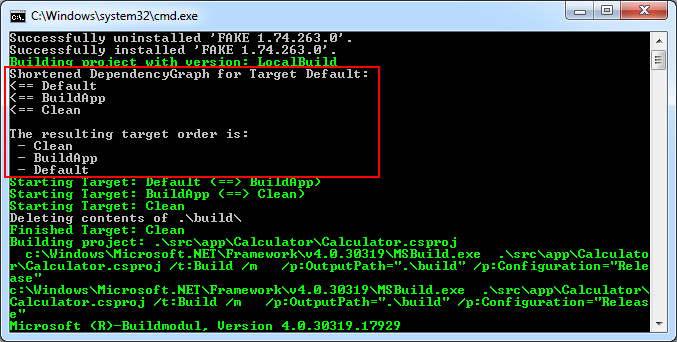 With this simple command FAKE will use nuget.exe to install all the package dependencies. This will fetch nuget.exe from nuget.org and also download an early version of NUnit that contains the NUnit runner. The edit to paket.dependencies does not replace the RestorePackages() step. The NUnit.Test.CalculatorLib test project references the NUnit version 2.6.2 library, so we need that version too. 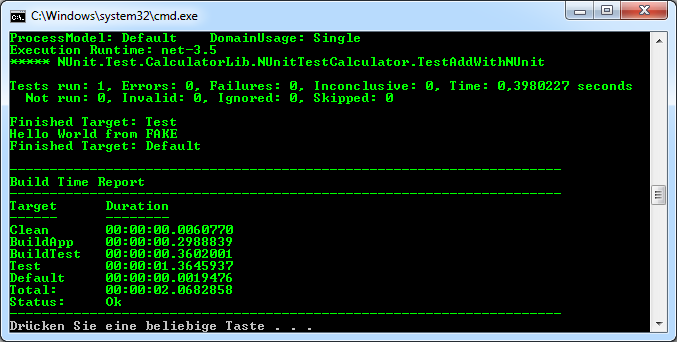 Our new Test target scans the test directory for test assemblies and runs them with the NUnit runner. FAKE automatically tries to locate the runner in one of your subfolders. See the NUnit task documentation if you need to specify the tool path explicitly. The mysterious part (fun p -> ...) simply overrides the default parameters of the NUnit task and allows to specify concrete parameters. The new Deploy target scans the build directory for all files. 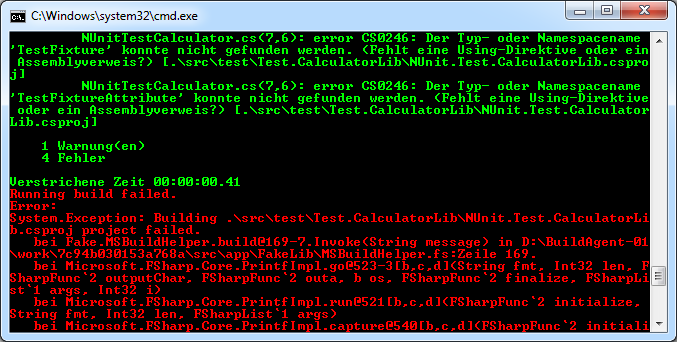 The result will be zipped to /deploy/Calculator.zip via the Zip task. If you want you could now add a FxCop target to your build in order to check specific naming rules or framework guidelines.